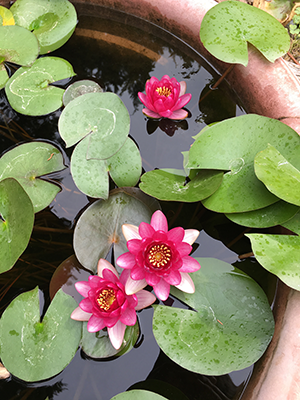 When I'm not gaming, one of my hobbies is growing water lilies, and 2017 was a great summer for blooms. Here are some pictures to tide you and me over till it's summer again . . . 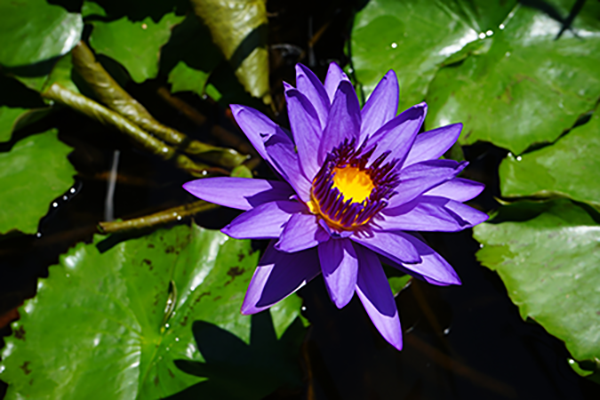 The purple lily is called Director Moore. It is my only "tropical" lily, meaning that it blooms very profusely (I have two plants, and between them I have three or four flowers almost every day in season). But it has to be protected from the cold, even more than other lilies. Director Moore also has a very strong scent. The yellow ones in the bowl are Texas Dawn. 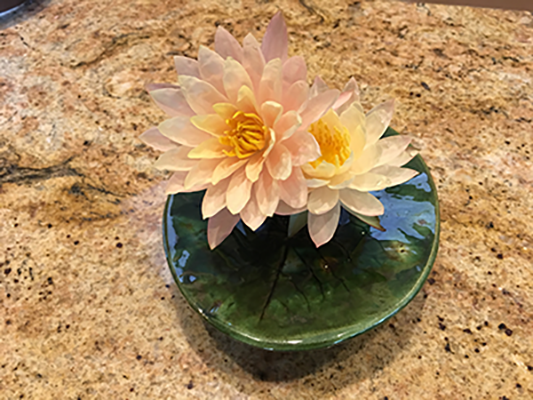 I usually leave my lily blooms on the plants and enjoy them outside, but this time, I cut a couple. They vary from a light yellow through peach. 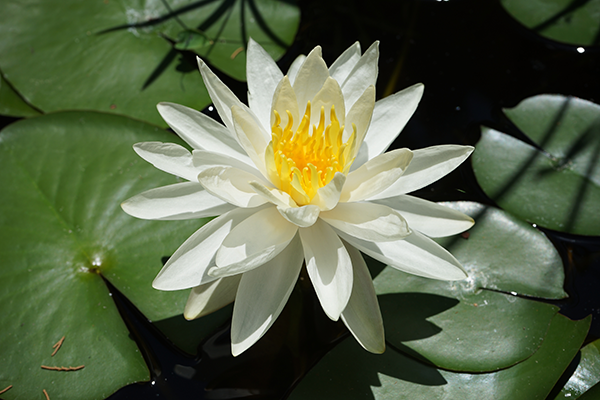 This is my strongest-growing lily – a single plant would cover 9 or 10 feet in diameter, easily, if I had the space to allow it. It was hybridized here in Texas. It also makes the biggest blooms, and they have a very distinct scent. The white one is Hal Miller. I have had this plant for more than 25 years and it just keeps on growing and blooming. It is one of the parents of Texas Dawn, which is why the bloom shape looks similar. The blooms are almost as big as Texas Dawn, but not as scented. Hal Miller was very popular at one time, and newer introductions have pushed it out of the limelight, but it's still a favorite of mine. The little red ones – and they really are little – are Perry's Baby Red. I had despaired of finding a red lily that could handle Texas summers, and then I lucked onto this one. It's a miniature plant; the vessel I have it in is just a big – okay, really big – flowerpot. It's unusual for it to make three blooms at once, but it happens, and here's the pic to prove it. The green hopping thing is not a frog, though I have plenty of those. 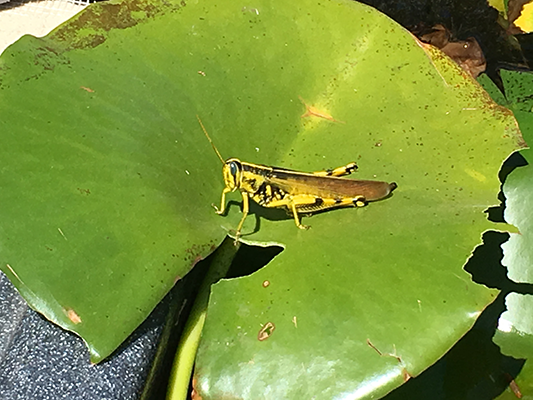 It is a Differential Grasshopper more than 2 inches long. As you can see, he's nibbled on the leaf. All part of the circle of life . . .